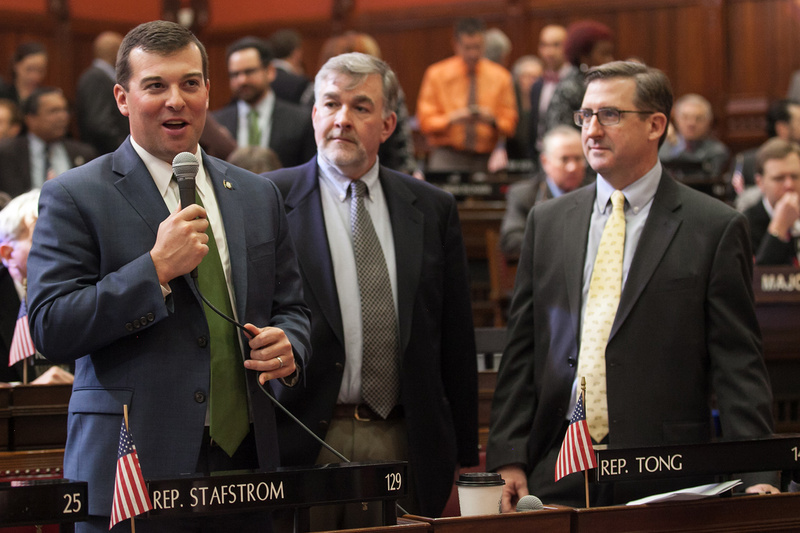 Representative Stafstrom joined by Joe Larchaveque (Bridgeport Board of Education Chairman) and Councilman Scott Burns (City Council Budget Committee Co-Chair) at the Governor's Budget Address. As you may know, Governor Malloy gave his annual Budget address today. Now that the Budget process is underway, I wanted to share some highlights from his presentation with you. These are challenging times and the Governor proposed some big changes, particularly regarding the relationship between the state and our cities and towns. I am very encouraged that the Governor has placed an emphasis on investing in our larger cities, including Bridgeport. He made a point to stress the inequities in our state’s regressive property tax structure and education coast sharing formula, which penalizes cities like Bridgeport and results in higher taxes, less spending on education, and reduced services. As you know reforming the property tax structure and pushing for increased education funding have been two of my top priorities. Certainly, there are many hard choices and decisions we will need to make in the coming months to balance the state’s bi-annual budget. As we address our challenges, I will continue to work to make Bridgeport a better place to live, work, and raise a family. As always, if you have any thoughts, questions, or suggestions concerning the State budget process please do not hesitate to contact me.